Reine Claude Doree is a traditional French gage, very similar to Old Green Gage. Indeed it is probably the ancestor of all the green gages, although when ripe Reine Claude Doree takes on an attractive green-golden hue which is only occasionally apparent in the English green gages. The flavour is generally regarded as amongst the best of all plums and gages. Please fill in the details below and we will let you know when Reine Claude Doree plum trees are back in stock. A traditional English green gage, with a reputation for excellent flavour. Reine Claude Doree is in flowering group 3. Reine Claude Doree is self-sterile and needs to be pollinated by another tree of a different variety nearby. Since it flowers in the middle of the blossom season it can be pollinated by most other plum trees. Reine Claude Doree is generally easy to grow, particularly compared to other gages. It is quite a vigorous tree, with a somewhat vertical habit until fruiting starts (when the weight of fruit naturally pulls down the branches). It is heavier-cropping than most gages, and can lapse into biennial bearing (fruiting in alternate years) if allowed to over-crop. Thinning of the fruitlets in June reduces this tendency, although thinning plum fruitlets by hand is a tedious job. However it also improves fruit size and quality. The green and yellow-skinned gages are effectively a sub-species of European plums, named after Sir William Gage who imported a batch of these trees from France to England in the 18th century. 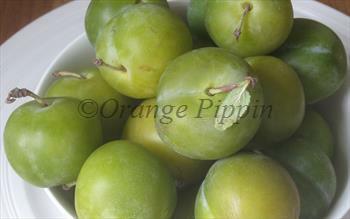 In France they are known as Reine Claude plums, and there are numerous varieties, all closely related. The origins of Reine Claude Doree are confused but it appears to be one of the oldest forms of French Green Gage, and possibly the ancestor of all modern green gages. It almost certainly pre-dates the spread of Green Gages into the English-speaking world. It is known to have been grown in south-west France in the 18th century but is thought to be much older.